Samuel (Sholem) Schwarzbard (Russian: Самуил Исаакович Шварцбурд, Samuil Isaakovich Shvartsburd, Yiddish: שלום שװאַרצבאָרד‎, French: Samuel (Sholem) Schwarzbard; 18 August 1886 – 3 March 1938) was a Russian-born French Yiddish poet of Jewish descent. He served in the French and Soviet military, was an anarchist, and is known for the assassination of the Ukrainian national leader Symon Petliura. He wrote poetry in Yiddish under the pen name of Baal-Khaloymes (English: The Dreamer). Schwarzbard was born in 1886 in Izmail, Bessarabia Governorate, Russian Empire to the Jewish family of Itskhok Shvartsbard and Khaye Vaysberger. His real given name was Sholem. After the proclamation of an order by the Russian Imperial government for all Jews to move out from the region within 50 versts (33 mi) of the border, his family moved to the town of Balta, in the southern Podolia region, where he grew up. His three older brothers died as children and his mother died whilst he was a child. In 1900, at an early age of 14 he became an apprentice to a watchmaker, Israel Dik. During his apprenticeship in 1903, he became interested in Socialism and began moonlighting as a revolutionary agitator for a group called "Iskra" – probably because of ties to Lenin's journal of the same name. At the time of the first Russian Revolution in 1905, he was based in Kruti, 30 miles north of Balta, where he was employed, in his own words, "fixing Cossack watches". A short time after participating in Jewish run and manned paramilitary activity while visiting his father in Balta, he was arrested and served a short stint in Proskurov and Balta prisons. He was released with the general amnesty granted as part of post-revolutionary tsarist "leniency". Fearing further arrests, Schwartzbard stole across the border into Austria-Hungary, where he lived and worked in a number of cities and towns, including the capital, Vienna, and Budapest. There, he was converted to anarchism, a political philosophy, especially the teachings of Peter Kropotkin, to which he would remain loyal the rest of his life. In August 1908, he claimed to have been unwittingly drawn into an anarchist "expropriation" (minor theft) in a small restaurant in Vienna. He was arrested and sentenced to time in a hard-labor prison. Fellow Austrian anarchist Pierre Ramus claimed years later that Schwarzbard had probably taken the rap for a comrade, noting that Schwarzbard always donated to the cause and never took from it. After serving his four-month sentence, he was released, but in Budapest (Crown of Hungary), he was again arrested, this time for merely carrying books by Max Stirner and Friedrich Nietzsche and admitting to the police that he was an anarchist. He gave his mother's maiden name (Weissberger) to the Vienna police, hoping to keep his real name out of the papers so he could still find work after release. Work did indeed become impossible for Schwarzbard to secure after the arrests, and in dire financial straits, he left Austria-Hungary for Switzerland. In January 1910, at age 23, he settled in Paris and found work with a series of watchmakers. The day before enlisting, he married his girlfriend of three years, Anna Render, a fellow immigrant from Odessa. On August 24, 1914, Schwartzbard and his brother enlisted in the French Foreign Legion. As a legionnaire, he entered the fray in November 1914 and participated in the Second Battle of Artois, near Arras in May 1915. On account of his excellent military record, in early 1915, he was moved to the regular French 363rd régiment d’infanterie and transferred south to the Vosges Forest. While there, he was shot through the left lung, fracturing his scapula and tearing his brachial plexus. The doctors gave him little hope of surviving the wound, but he slowly improved over the next year and a half until he was in good enough shape to return to Russia. His left arm was left virtually useless, and he was awarded the Croix de guerre for his courage in the World War. He was demobilized in August 1917 and in September, traveled with his wife to the Russian Republic, established after the February Revolution. On the French boat Melbourne, he was arrested for communist agitation and was handed over to Russian authorities in Arkhangelsk. He later traveled to Petrograd, where he joined and served in the politically mixed Red Guards (1917–1920). Schwartzbard commanded a unit of 90 sabers in the brigade of Grigory Kotovsky. Schwarzbard fought in two separate campaigns. The first from February to May 1918 with a group thrown together from anarchist volunteers in Odessa called Otriad Rashal, after a charismatic young Bolshevik leader who had been killed in Romania a short time before. Indeed, the unit was formed to defend the Ukrainian frontier against Romanian invasion near Tiraspol, but it was soon being chased eastward by German and Austrian troops into the Steppe, until it was finally betrayed by the Bolsheviks, who killed a number of Schwarzbard's sleeping comrades. Schwarzbard managed to escape and ride the rails back to Odessa, now under German occupation. During the occupation and in the chaos that ensued after the Germans left, Schwarzbard lay low, survived a serious bout with typhus and worked securing facilities and supplies for the newly forming Soviet school system. He had himself tried to establish independent anarchist schools, but was willing to work with the Bolsheviks as they increasingly centralized the school system. Hearing news of countless pogroms, Schwarzbard tried to volunteer as a Red Guard Soldier. After many delays, he was finally accepted into an "International Brigade" in June, 1919 and begin his second revolutionary campaign. The next two months were perhaps the worst of his life. His unit suffered defeat to the combined forces of Petliura and Denikin who were uneasy allies at the time. Schwarzbard was in Kiev when both, Ukrainian and White Armies entered, his unit having since been wiped out and disbanded. It was in this period, July–August, 1919 that Schwarzbard witnessed first hand the ruins and human devastation left by pogrom violence—images that would haunt him for the rest of his life. He again managed to ride the rails back to Odessa, where he was betrayed by a fellow anarchist to the White forces in control of the city. Before they could catch him, he found out that as a French war veteran, he could catch a ship back to France. In late December, 1919 he boarded the Nicholas I [sic] and sailed over Istanbul, Beirut and Port Said back to Marseilles. He was back in Paris by January 21, 1920. In the turmoil that transpired in the period of the Russian Civil War, fourteen members of his family perished in anti-semitic pogroms, including his most beloved uncle, who was killed in Ananiev. The names of all fourteen were listed for his trial in 1926 and can be found in the YIVO Schwarzbard Archive. In 1920 disillusioned by the willingness of his comrades to prostitute themselves and the revolution for a few rubles Sholom moved back to Paris where he opened a clock-and-watch repair shop. There he was active in the French labor movement as an anarchist, and in 1925 became a French citizen. He was acquainted with prominent anarchist activists who had emigrated from Russia and Ukraine, including such figures as Volin, Alexander Berkman, Emma Goldman, as well as Nestor Makhno and his follower Peter Arshinov. In Paris Schwartzbard also became a member of the "Union of Ukrainian citizens". He contributed a number of articles to New York's anarchist daily Freie Arbeiter Stimme under the pseudonym "Sholem"—his first name, but also Hebrew for "peace", a fact he was quite proud of as an avid fan of Count Leo Tolstoy. Symon Petliura, who was head of the Directorate of the Ukrainian National Republic in 1919, had moved to Paris in 1924 and was the head of the government-in-exile of the Ukrainian People's Republic. Sholom Schwartzbard, who had lost his family in the 1919 pogroms, held Symon Petliura responsible for them (see the discussion on Petliura's role in the pogroms). According to his autobiography, after hearing the news that Petliura had relocated to Paris, Schwartzbard became distraught and started plotting Petliura's assassination. A picture of Petliura with Józef Piłsudski published in the Encyclopedia Larousse allowed Schwartzbard to recognize him. On May 25, 1926, at 14:12, by the Gibert bookstore, he approached Petliura, who was walking on Rue Racine near Boulevard Saint-Michel of the Latin Quarter, Paris, and asked him in Ukrainian, "Are you Mr. Petliura?" Petliura did not answer but raised his cane. Schwartzbard pulled out a gun shooting him five times and, after Petliura fell to the pavement, twice more. When the police came and asked if he had done the deed, he reportedly said, "I have killed a great assassin." Other sources state that he attempted to fire an eighth shot into Petliura, but his firearm jammed. 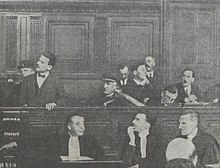 Schwartzbard was arrested and was put on trial by the Public Court Committee on October 18, 1927. His defense was led by Henri Torrès, a renowned French jurist who had previously defended anarchists such as Buenaventura Durruti and Ernesto Bonomini and who also represented the Soviet consulate in France. The core of Schwartzbard's defense was to attempt to show that he was avenging the deaths of victims of pogroms, whereas the prosecution (both criminal and civil) tried to show that (i) Petliura was not responsible for the pogroms and (ii) Schwartzbard was a Soviet agent. Both sides brought on many witnesses, including several historians. A notable witness for the defence was Haia Greenberg (aged 29), a local nurse who survived the Proskurov pogroms (now, Khmelnytskyi, Ukraine) and testified about the carnage. She never said that Petliura personally participated in the event, but rather some other soldiers who said that they were directed by Petliura. Several former Ukrainian officers testified for the prosecution, including Red Cross representative who witnessed Semesenko's report to Petliura. According to Ukrainian historian Michael Palij, a GPU agent named Mikhail Volodin came to Paris in August 1925 and met Schwartzbard, who began stalking Petliura. 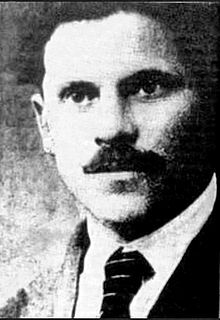 He had previously planned to assassinate Petliura at a gathering of Ukrainian émigrés marking Petliura's birthday but the attempt was foiled by anarchist Nestor Makhno who was also at the function. Hanokem Street (Hebrew: "The Avenger Street"), in Beersheba. In 1928, Sholom Schwartzbard decided to emigrate to Palestine, which was under British Mandate. However, the British authorities refused him a visa. In 1937 Schwartzbard traveled to South Africa to raise money for a Yiddish language Encyclopedia. He died in Cape Town on March 3, 1938. In 1967, in accordance with his will, his remains were transported to Israel and buried in Moshav Avihayil. Several cities in Israel have streets named after him, including Jerusalem and Beersheba. Schwartzbard was popularly referred to as the nokem – the avenger – of Ukrainian Jewry. Schwartzbard is the author of numerous books in Yiddish published under the pseudonym "Bal Khaloymes": Troymen un virklekhkeyt (Dreams and Reality, Paris, 1920), In krig mit zikh aleyn (At War with Myself, Chicago, 1933), Inem loyf fun yorn (Over the Year, Chicago, 1934). Sholom Schwartzbard's papers are archived at YIVO Institute for Jewish Research in New York. They were rescued during World War II and smuggled from France by the historian Zosa Szajkowski. ^ a b c "Schwarzbard, Sholem." Encyclopaedia Judaica. 2nd ed. Macmillan Reference USA, 2007. Vol. 18, p. 191. Retrieved via Gale Virtual Reference Library database, 2019-03-28. ^ Saul S. Friedman, Pogromchik: The Assassination of Simon Petlura. New York : Hart Pub, 1976.